Ebay ATV Parts. 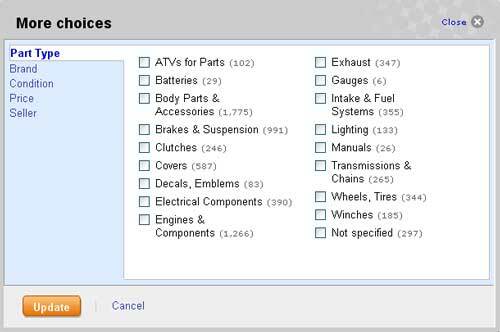 How To Use Advanced Search To Find Your ATV Parts. Have you ever had trouble doing an Ebay ATV parts search? Yeah, us too. So we're going to show you the easy way using the advanced search options. There's a few tricks that can really improve your chances of finding what you want. So here are the step by step instructions complete with pictures! Advanced Search Options for Ebay ATV Parts. Start at the Ebay Motors home page buy clicking the highlighted box. Starting at the Ebay Motors home page - click the "Advanced Search" as highlighted above. 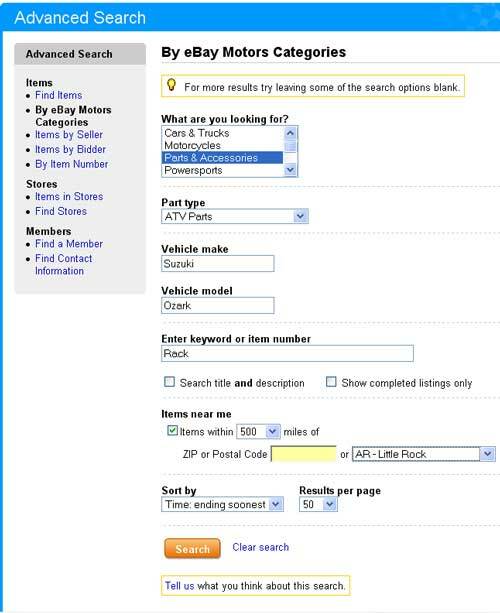 That will bring up the Advanced Search page which lets you search by Ebay Motors Categories. Click on Parts and Accessories as highlighted below. In the Part Type box - select ATV Parts. Type in vehicle make and model in the appropriate boxes. looking for a specific part - type that name like the example below. To see all the parts listed for the make and model you specified - leave the box blank. For the largest number of matches - tick the box for "Search title and description". This works best when there aren't many results for your keyword. To see what has already been sold, you tick the box for "Show completed listings only". Good way to see what stuff has been selling for. The "Items near me" category lets you narrow the search by distance - tick the box for "Items within (select the number of miles from the drop down menu) of (select either a zip code or nearby major city). Finish by selecting your "Sort by" and "Results per page" preferences. Hit the search button and enjoy the payoff to all this labor! 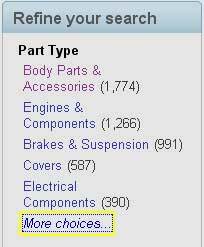 Advanced Search Page in Ebay Motors. If you leave the keyword box blank in the example above - the results page will have a box like this on the left hand side of the page. Now here's the hot tip - click the "More Choices" text like the highlighted example. A box like the one shown below will appear. Check out all those category listings! The numbers in parentheses are the number of items currently listed in those categories. Just click the box in front of the category you want to look in - and instant gratification! This is the best way we've found for quickly finding the Ebay ATV parts we want. We hope these tips make your searches go a little smoother too. Narrow your search with the More Choices box. Ebay ATV Parts - Here's the link to get you started! Ebay ATV Auctions. Complete list of ATV related auctions on Ebay right now.